Ernie Broglio was a key player in two Cardinals trades _ the famous one involving Lou Brock and the largely forgotten one that led to him becoming a prominent part of the St. Louis rotation. On Oct. 7, 1958, the Cardinals acquired Broglio and Marv Grissom from the Giants for Billy Muffett, Hobie Landrith and Benny Valenzuela. The top names in the deal were relief pitchers Grissom and Muffett. Landrith was a backup catcher, Valenzuela a utility infielder and Broglio a minor-league pitcher. Regarding Ernest Broglio, he was “not to be confused either with movie Academy Award winner Ernest Borgnine or a plain old imbroglio,” the Post-Dispatch reported. “Broglio must be suspect because he didn’t make it with the Giants last spring and no club needs pitching more than San Francisco,” the Post-Dispatch concluded. Dixie Walker, who managed Broglio at Class AAA Toronto in 1958, was on good terms with the Cardinals. His brother, Harry Walker, was a Cardinals coach and Dixie worked with Cardinals general manager Bing Devine at Rochester in 1955. It was on Walker’s advice that Devine pursued Broglio. In the Giants’ organization since 1956, Broglio had opened the 1958 season with their Class AAA club at Phoenix and posted an 8-1 record. The Giants, though, were seeking a veteran pitcher and they made a deal with Toronto in July 1958 for former big-leaguer Don Johnson. The Giants sent Broglio, along with outfielder Jim King and pitcher Ray Crone, to Toronto. Broglio, 23, apparently was loaned to Toronto, which wasn’t affiliated with any big-league club. Broglio was an immediate success with Toronto. In his first start for Dixie Walker, Broglio struck out a franchise-record 15 against Buffalo in 11.1 innings. Three days later, Broglio pitched a three-hitter against Montreal. On Aug. 6, Broglio pitched a two-hit shutout against Havana. The next day, he pitched seven innings in relief. “A throwback to pitchers of another era _ that is the reputation of Ernie Broglio, workhorse of the Toronto Maple Leafs’ mound corps, who appears to thrive on only two days rest,” Th Sporting News reported. Broglio was 9-3 for Toronto in the regular season and 2-0 in the International League playoffs. For Phoenix and Toronto combined, Broglio had a 17-4 regular-season record. Two weeks after he was traded to St. Louis, Broglio was invited to join the Cardinals on their tour of Japan. The Cardinals were scheduled to play 16 games against Japanese teams in October and November. Broglio took full advantage of the chance to impress his new club. Described by The Sporting News as “the big surprise,” Broglio was the Cardinals’ biggest winner on the tour, posting a 4-0 record and 1.55 ERA and striking out 30 in 28 innings. Based on that showing, Hemus tabbed Broglio as the staff’s No. 4 starter entering spring training in 1959. Broglio further impressed the Cardinals by reporting to spring training three pounds under his assigned weight of 195. Broglio earned a spot in the 1959 Cardinals’ rotation and finished the season tied with Larry Jackson for the club lead in shutouts (three). Broglio also ranked second in strikeouts (133) and third in innings pitched (181.1) for the Cardinals. 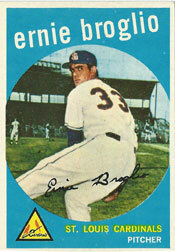 After losing his first five decisions, Broglio completed the 1959 season at 7-12 with a 4.72 ERA. He was 7-9 in 25 starts and 0-3 in 10 relief appearances. In six years (1959-64) with St. Louis, Broglio was 70-55, including seasons of 21 wins in 1960 and 18 wins in 1963. When the Cardinals sent Broglio to the Cubs on June 15, 1964, in a deal involving Brock and others, most thought the transaction favored Chicago, but Broglio hurt his arm and went 7-19 with a 5.40 ERA in three years with the Cubs. Brock became a Hall of Fame player who broke stolen base records, achieved 3,000 hits and ignited the Cardinals to three pennants and two World Series titles.